It’s once again fight day here at LowKickMMA, and the talent on display tonight (Saturday, October 1st, 2016) will come in the form of UFC Fight Night 96. Joachim Christensen vs. Luis Henrique da Silva in a light heavyweight bout closed the UFC Fight Night 96 preliminary card on Fox Sports 2. A fun fight with a nice finish. In round 1, they clinch right out of the gate. Moments later, they went back to striking. Silva dropped him with a right hand and then landed some leg kicks. Silva was pressing forward and was mixing up things with kicks. In round 2, they clinched again early in the round. Christensen dropped him with a knee and got into guard and rained down more strikes. Christensen controlled Silva while on the ground. Silva scrambled and got on his back and landed some more strikes. Silva locked in an armbar for the win. Hacran Dias and Andre Fili met in a featherweight bout at UFC Fight Night 96. In round 1, Fili dropped him with a left hook and landed a series of right hands when he was on the ground. Dias got up and clinched with him up against the fence and took him down. Dias landed some right hands then Fili got back to his feet and they exchanged to the bell. In round 2, Dias clinched and took him down and got into half guard. Dias landed some shots while on top. Fili got back to his feet and they went back to striking. Fli took him down and landed some leg kicks. Dias popped up and they went back to striking. Fili landed a judo toss to end the round. In round 3, Dias took him down early in the round but Fili got right back up. Fili took him down with about two minutes to go and rained down strikes to end the round. Fili picked up the decision victory. Shamil Abdurakhimov and Walt Harris met in a heavyweight bout at UFC Fight Night 96. In round 1, after a feeling out process, Abdurakhimov scored a takedown and got side control then rained strikes. Harris got back to his feet and they exchanged. Harris was bleeding from the back of his head. In round 2, Abdurakhimov missed a spinning fist and fell down. Abdurakhimov got up and Harris locked in a guillotine choke and took him to the ground. Abdurakhimov got out of it and stood up. They exchanged to end the round. In round 3, they kept it on the feet for the majority of the round. Harris had the range down and landing excellent strikes. They exchanged to end the round. Abdurakhimov scored the split decision victory. Keita Nakamura vs. Elizeu Zaleski dos Santos in a welterweight opened the UFC Fight Night 96 Fox Sports 2 preliminary bouts. In round 1, Nakamura threw a head kick to start the round and clinched with him up against the fence. Nakamura took him down and got guard but Santos stood up. Nakamura clinched and took him down and got his back. Nakamura worked him over with strikes and was looking for a rear-naked choke. Santos got to his feet with just seconds left in the round and blitzed him with strikes. In round 2, they exchanged for the first part of the round. Nakamura scored a takedown midway through the round. Nakamura got his back and works him over with strikes. Santos scrambled to his feet to end the round. In round 3, Nakamura kicked Santos in the nuts midway through the round. After a pause in the action, Nakamura scored a takedown. Santos got back to his feet but Nakamura took him down. Santos scrambled and got side control and went for a side choke then let go of it and got back mount. Nakamura scrambled and Santos stayed on him. Nakamura scrambled and got his back with less than a minute to go. 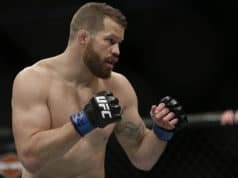 Nate Marquardt vs. Tamdan McCrory in a middleweight bout finished off the UFC Fight Night 96 Fight Pass preliminary card. A decent fight that finished strong. In round 1, they had a feeling out process early. Marquardt took him down midway through the round and got guard. McCrory went for a triangle off his back but couldn’t get it. Marquardt rained down some elbows and strikes. McCrory tried to scramble off his back but Marquardt stayed on him and landed some more strikes. In round 2, McCrory landed a good combo and then clinched with him midway through the round. Marquardt scored a takedown moments later and got guard. Marquardt landed some more strikes and just dominated him. McCrory got up and Marquardt landed a head kick that KO’d McCRory for the win. Ion Cutelaba and Jonathan Wilson met in a light heavyweight bout at UFC Fight Night 96. A solid fight. In round 1, they had a feeling out process early. They kept the fight on the feet. Near the end of the round, they had a nice exchange and Cutelaba clinched with him up against the fence. In round 2, Cutelaba kicked him in the groin very hard. There was a pause in the action. Back to action, Wilson tagged him with a right hand. Cutelaba was throwing a lot of spinning kicks early. Cutelaba pressed him and landed some good combos up against the fence. Wilson was trying to hold his own. Cutelaba clinched and landed a knee to the body. Cutelaba put him up against the fence and landed some more combos. Wilson fired back with his own to put on an exciting final minute into the round. Cutelaba shot for a takedown but it was stuffed. In round 3, they mixed it up nicely throughout the round. Cutelaba landed a big right hand midway through the round. Cutelaba was bleeding from his nose. Wilson was trying rush out of the way from a strike and kick. They exchanged to end the round. 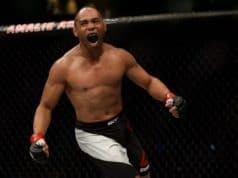 Cutelaba picked up the decision victory. Curtis Blaydes and Cody East met in a heavyweight bout at UFC Fight Night 96. A very fun fight. In round 1, Blaydes scored an early takedown but East got right back to his feet. Blaydes clinched and then let go and they went to striking. Blaydes scored another takedown just inside a minute into the round. Blaydes pressed him against the cage and landed some elbows while in side contract. East got back to his feet but Blaydes took him down and got mount and rained down strikes. East got back up to his feet with two minutes to go took Blaydes but Blaydes got up quick. East clinched with him. They had a wild exchange then East took him down to end the round.In round 2, Blaydes took him down right out of the gate and got full guard. Blaydes rained down elbows to earned the TKO victory. Opening the UFC Fight Night 96 Fight Pass prelims was Kelly Faszholz vs. Ketlen Vieira in a women’s bantamweight. A solid fight. In round 1, Vieira closed in and clinched with her inside a minute into the round. Faszholz separated and shoved her down then clinched up against the fence midway through the round. Vieira tripped her and took her down moments later. Vieira got in guard and rained down strikes. In round 2, Vieira took her down to begin the round and got in guard and rained down strikes. Faszholz scrambled to her feet moments later but Vieira caught a body kick, tripped her and took her down to get back into guard with a just a minute remaining. In round 3, Faszholz started to let her hands go and was throwing more volume. Faszholz clinched with her up against the fence and landed some knees to the body. Vieira scored a late round takedown. Vieira picked up the decision victory.